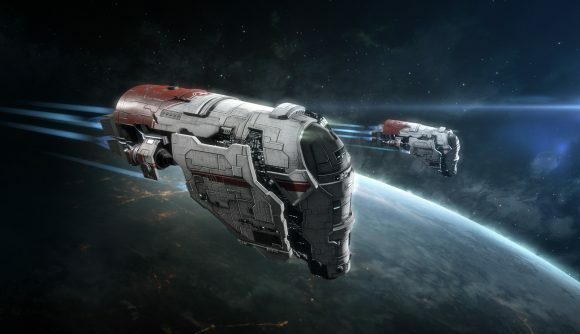 The battle between CCP and Eve Online botters has been a source of controversy within the community, with many players feeling the developers haven’t done enough to combat bots in the game. Today, CCP went for a creative solution – in essence, staging public botter executions for the entire playerbase to see. This is GM week in Eve, where the title’s game masters host an array of events both in-game and on social media. One such event began earlier today, with CCP teleporting botters into Yulai’s high-sec area and marking them as suspect. For the Eve laymen, that means that the flagged ships were free targets for Eve’s NPC security force and players alike, leading to a proper massacre on the affected ships. On Reddit, CCP Falcon simply says “Ah, fun times” – which is pretty much the tone of the community’s response following the event. One thread has collated the kills, and it was streamed via CCP’s own Twitch channel. Apparently, such an even had been in planning for some time, and finally went down thanks to the customer support and security teams. If it’s a hearts and minds move it’s certainly been an effective one, at least judging by the tone of responses so far. We took an in-depth look at Eve’s botting problem earlier this year, and this is ultimately only a small addendum to the issue – but it is, in fairness, a spectacular display.